Views have been split this week as it was announced that Tracy Emin was to become a Professor of Drawing at the Royal Academy in London. 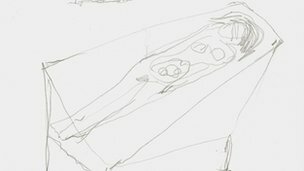 Emin is probably best known for her involvment with the Young British Artists, alongside the likes of Damien Hirst, Mat Collishaw, Sam Taylor-Wood and Sarah Lucas. Her work typically comes in the form of installations, like the unmade bed, or neon slogans, rather than straightforward pencil to paper. 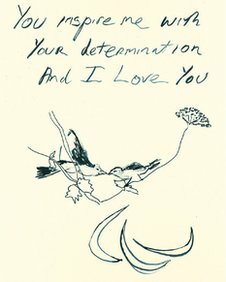 One of Emin's latest drawings, however, was produced for a poster for the 2012 London Olympics, and depicts two birds kissing under text that reads "You inspire me with Your determination And I love you." Skepticism has arisen over the decision to make Emin a Professor of Drawing at the RA, as her artistic talents have been brought into question. Painter Diana Armfield told The Times that she had seen what "I suppose are drawings" but that she "wouldn't have thought that her talents were that way." Drawings such as Emin's contribution to the postcard sale at the Royal College of Art earlier this year (as pictured below) have added fuel to the fire of those questioning Emin's skills in the area of drawing, and whether she deserves such as position at the Royal Academy. What's more, this is the first time in the history of the Royal Academy that a woman has been allowed to become a professor. The academy was founded in 1768 through a personal act of King George III, and has been male dominated ever since. On BBC News, Emin was quoted as having said "I'm really excited to be teaching again after so many years…I hope that I can add something constructive to the Royal Academy Schools." Alongside Emin, Fiona Rae was also appointed Professor of Painting, and Richard Wilson was made Professor of Sculpture.